My card was inspired by this card by Heiki. I used the basic design with the image layer and flower, but added a different background by using My Favorite Things Dienamics dies for the scalloped layer and the black stitched rectangle layer. The script stamp is called long writing background by Hero Arts and the die is called Prim Poppy by Memory Box. I colored the flower with Memento markers. Thank you for joining us at Brown Sugar Challenge. and good luck. 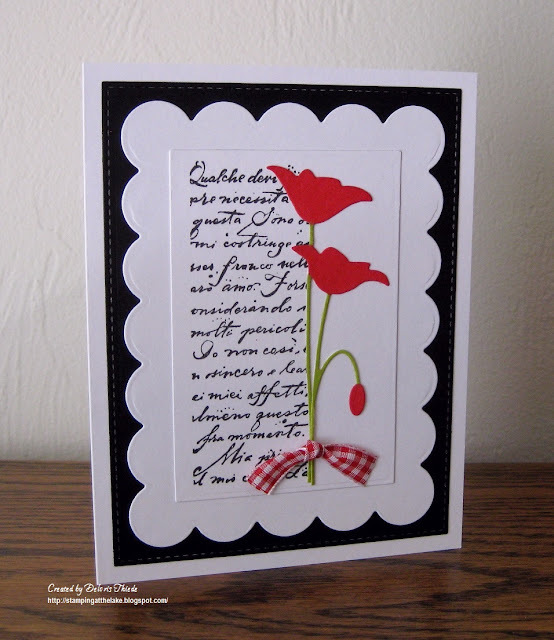 A totally Divine card Delores, the die cup Poppy looks beautiful against the stamped script. Many thanks for joining in at FlonzCraft Vintage Stamping Challenges. Very elegant and so lovely with the red poppies. This is really elegant...love it! Thank you for playing along with us at Catch the Bug! Absolutely beautiful, the poppies took great and the script goes perfect with the card. This is just a beautiful card, I love everything about it! Thanks so much for playing along with us at CAtch The Bug this week and hope to see you next week.